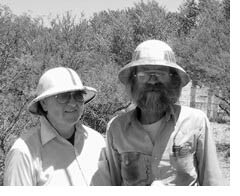 Ed and Dee are full-time commercial beekeepers in Tucson, AZ. Ed is a fourth generation beekeeper. Dee and Ed work side by side in all phases of their operation. In addition to the conventional activities of beekeeping, they mill their own woodenware and wax foundation, select and maintain a stock of slightly smaller bees highly adapted to their area, and produce their own queens. Their non-chemical ‘back to basics’ approach to beekeeping leads them to spend much of their spare time in libraries where they search for obscure bits of information which, when assembled in logical order, yield insights into old problems such as bee kills due to the use of pesticides, and new problems like parasitic mites. Such has been their pursuit of an understanding of the importance of comb cell diameter, an issue emanating out of their bee breeding activities and search for non-chemical methods of resolving disease and mite problems. The Lusbys found that comb cell diameter differs among the various sources of foundation manufactured in the United States and around the world. Following publication of this discovery in 1990, they undertook an all out effort to resolve the question of optimal natural cell diameter and its potential impact on colony vigor. Having identified, to their own satisfaction, optimal cell diameter for their geographic area (Southern Arizona), they have nearly completed converting their entire operation to a ‘natural system’ incorporating their concept of smaller cells. They have widely reported to beekeepers that their use of optimal natural cell diameter has significantly reduced disease and mite infestation in their colonies while simultaneously increasing brood viability and colony productivity. Convinced, a number of beekeepers have embraced the Lusby’s management strategies. Ed and Dee have now turned their attention to developing a world map that will identify, for beekeepers, optimal natural cell diameter by latitude. USA Paralysis – Vicious Bee Breeding Historical Background. Suggested Biological Manipulative Field Management for Control of Honeybee Mites. Part 2 Prevention – A Possibility! THE SMALL HIVE BEETLE, AETHINA TUMIDA.